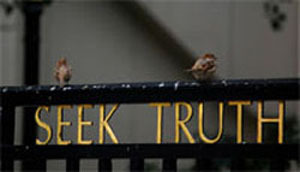 Seek the truth for it Truth is the state of real things and is void of deception. It will always be revealed. It is open and transparent; it is unafraid and has integrity. Why do people lie and use deception? Fear, the only reason a person will conceal something from others. There are many things that drive people to deceive us; fear of being embarrassed, punishment, rejected, or seeing their inner core, that fragile insecure soul that tries to hide and does not want to be revealed. Fear influences many of our responses and behavior; it keeps stress and pressure in a relationship. Even when we claim that our lie was to protect another person’s feelings, fear is lurking in the background. When you lie, you do not lie to others, you lie to yourself. Those lies are eventually exposed but then you have lost the other person’s trust. Trust is one of the most valuable things you will ever earn. Sometimes the most hurtful thing you can do to someone is not always deceptive in nature; it involves being honest, with or without, the intention of hurting the other person. Try to put yourself in the other person’s shoes when being honest about sensitive matters and try to be empathetic to their situation. Remember the times when you needed kindness in dealing with reality and hurtful issues, extend that kindness to others because at times, the hardest thing in life is not to be honest with others; it’s to be honest with ourselves. Be positive and kind in this life, it can be contagious. Is truth honesty or integrity? It’s really not either, honesty is telling the truth to other people and integrity is doing the right thing even if no one else will ever know. Never compromise your integrity, live your life as open and transparent as possible. Seek the truth and when you find it, hold on to it tightly, never let it go and you will truly be free.